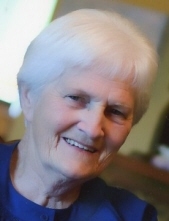 A Celebration of Life service will be held for Margaret Anne Doughty April 13th at 11:00 AM in the Chapel of Macy and Son Funeral Directors, McMinnville. Margaret was lovingly surrounded by family as she was welcomed into heaven March 18, 2019. From her birth place of Prosperity, WV to the Alaskan Tundra Margaret lived in multiple states during her lifetime. In her teen years Margaret worked in the family restaurant. The majority of her 40 year career was spent as a bookkeeper. She was loved by many in the communities she lived in. Margaret made countless meals for family, friends and neighbors over the years when needed. She loved to help and serve others! One of her passions was holiday baking, her family and friends loved those goodies! Her greatest love was for her family, affectionately known as Margie by family and longtime friends from her youth. Margaret was preceded in death by her husband William Sheldon Doughty, father Paul Revere Hollandsworth, mother Mayme Dott Kilgore, and sister Patricia Dean Keskey. She is survived by her daughter Paula Ann Wertanen, son Sheldon William Doughty, grandson Andrew David Wertanen, granddaughter Carolyn Marie Wertanen, one great grandson, and sister Barbara Louise Woodard. Memorial contributions may be made to St Jude’s Children’s Hospital in care of Macy & Son. To send flowers or a remembrance gift to the family of Margaret Anne Doughty, please visit our Tribute Store. "Email Address" would like to share the life celebration of Margaret Anne Doughty. Click on the "link" to go to share a favorite memory or leave a condolence message for the family.